In Volume 1 of the Professional Workroom Handbook of Swags, we taught you the basic swag shape and how to define, pattern and fabricate beautiful Board Mount swags, Cutout swags and Point-to-Point swags. 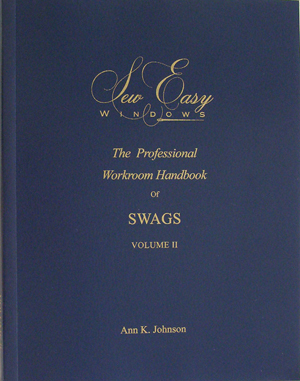 In Volume 2 of the Professional Workroom Handbook of Swags, we have built on the basic knowledge from Volume 1 to teach you how to define, pattern and fabricate three additional swag styles: Austrian, Boxed and Arched/Slanted. These three styles are not as widely used. Either we are not as familiar with the style (Austrians and Boxed swags) or we are wary of the difficulty factor (Arched/Slanted swags). As full-service workrooms, you must be able to create swags in any requested shape, size or style. Understanding the engineering behind the swag pattern allows you to draft swag patterns or modify other patterns or systems to exceed their limitations. Volume 2 will give you the confidence to say yes to any swag job. Scroll down to read more details on each style of swag covered in the book. This is a beautiful swag shape. The pleat allowances are vertical, hidden under the cascades. The long short point, lack of bulk at the board level and conservation of fabric make this an excellent substitute for traditional swags in many treatments. 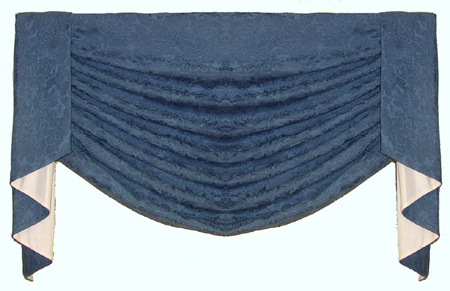 It is also the basic swag pattern used in Austrian valances. You will be amazed at how versatile and easy these swags are. The gentler swoop of folds makes them very forgiving, and their range of design applications are limitless. This comtemporary swag is unique in that it can completely stand alone. 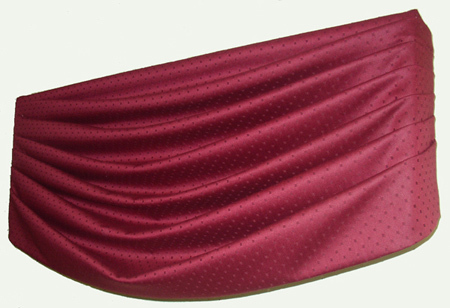 The swag folds wrap the legs, finishing the treatment and covering the returns. The basic pattern shape is the same for this swag. Volume II teaches you the step-by-step process to draw, cut and fabricate this swag with ease. The trick behind these swags is cutting the pattern to follow the shape of the arched curve or slant of a cathedral ceiling. Patterns are not readily available because this swag must be cut to the exact shape of the finished treatment. Volume II takes you step by step through the process of designing the arched treatment, identifying the arched styles and drawing the pattern. 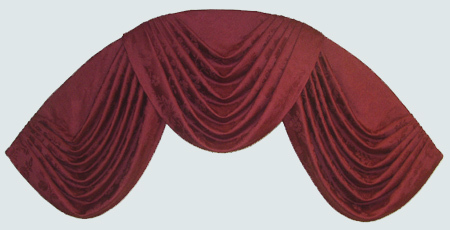 You will be able to design and draw patterns for beautiful arched and slanted swags of any size and length. An asymmetrical swag is one in which the left side is not a mirror image of the right side. This includes the raised/lifted swags on arched windows, the popular turban swag and many many other asymmetrical designs. Every asymmetrical swag is simply a combination of two different swag styles and/or sizes. Volume I and II have taught the steps to draw any swag style to any size or shape. In this chapter, we teach you the process of identifying which swag style(s) make up the asymmetrical swag and how to draw the asymmetrical pattern. Surprisingly, this chapter in the book is the smallest. This is because drawing an asymmetrical swag is simply the process of using all of the knowledge you already have in drawing each of the six basic swag styles. Nearly 200 pages of detailed information from designing the treatment to drafting the pattern, troubleshooting, sewing and installing Austrian swags, Boxed swags, Arched/Slanted swags and asymmetrical swags. Every step illustrated with drawings and photos. The best part of this book are the worksheets in the Appendix. Each worksheet guides you through the process of defining and drawing the pattern for a specific swag style. You can copy and use these worksheets in your workroom. I offer discounts for group buys. Contact me if you are interested in placing an order for 10 or more books. "I am no longer anxiously waiting, I have Ann K. Johnson's Handbook of Swags Volume II. I can attest that it is the perfect addition to Volume I. This book will help you make any type of asymmetrical swag in any combination of swag types. The book also coversTurban, Boxed and Austrian Swags. This book is a "must have" for workroom professionals. In addition to Volume I, by using the instructions in these books, you will have the confidence that you can make any swag! Add profitability to your workroom capabilities. This book is worth more than it's weight in gold."